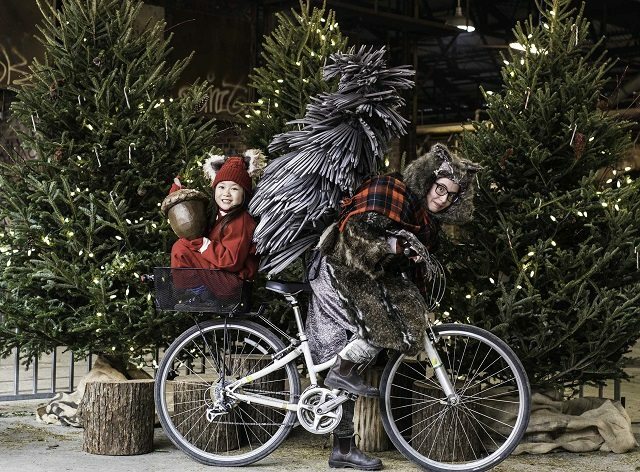 Eponine Lee, left, and Kate Walker go wild for the holidays with Common Boots Theatre’s Tails From the City at the Evergreen Brick Works. Photo by Neil Silcox. Holiday entertainment is in full swing at Toronto’s theatres, and the options are many. You can get glammed up for a night out with Cinderella, or spend some time hanging at Kim’s Convenience. Or if you prefer the fresh air, you can take in the annual walking tour-slash-play at the Evergreen Brick Works. The Phantom of the Opera is back in town after all these years, bringing with him a bigger chandelier. And panto king Ross Petty is saying farewell to the stage, wrapping up two decades of bad makeup, bad puns, and bad behaviour. Torontoist has been checking out the season’s theatrical cornucopia and offers this guide to new fare and old favourites. Henri Fabergé Presents: One Hell Of A Creskin’s! A returning holiday spectacle, tonight’s one-night-only event is definitely not for the kids. Transmedia artist Henri Fabergé and an all-star cast of Toronto comedians and musicians—Maylee Todd, Kayla Lorette, members of Tony Ho, Get Some, and The Bicycles—have developed a sprawling and bizarre backstory over years of cabaret and theatrical performances, but all you really need to know is this: rival faux-Victorian institutions Boyce Naval Academy and Grey Naval Academy compete in performance and song to best celebrate the winter miracle of St. Creskin, whose magically replenishing taint fed the hungry for days. 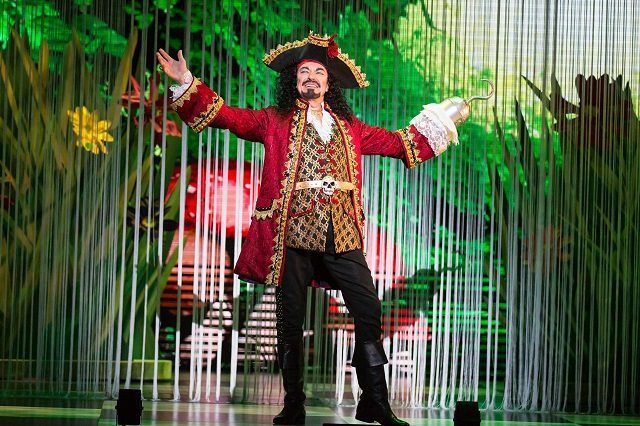 Panto king Ross Petty takes his final boos as Captain Hook in this year’s musical fairy tale, Peter Pan in Wonderland. Photo by Racheal McCaig Photography. For his final year as Toronto’s favourite panto villain, Ross Petty has chosen to play not just one bad guy, but two: Captain Hook of Peter Pan fame and Donald Trump of Republican Party infamy. There’s no question who’s the bigger villain, which may be why Petty limits his Trump impersonation to a cameo appearance—if he stayed onstage any longer we’d be reaching for the rotten tomatoes. Still, Petty provokes plenty of boos and hisses just doing Hook, which is the way he likes it—he luxuriates in derision as if it were a bubble bath. The plot for this, Petty’s 20th holiday panto as producer-star, is even more hare-brained than usual, being a messy mashup of Pan and Alice’s Adventures in Wonderland. Never mind: it’s a chance, not just to jeer Petty, but to cheer his long-time commitment to showcasing bright young talent (check out amazing dancer Lamar Johnson as the Mad Hatter) and letting comedy aces like Jessica Holmes (delicious as a baby-voiced Queen of Hearts) share in the scenery-chewing. And while Petty is leaving the spotlight, he’ll continue to produce the shows, so we hope he retains his faithful partners-in-shtick, the ever-ebullient Eddie Glen (here, as Smee) and Dan Chameroy in his irresistible drag alter-ego of Plumbum—or, for this show, a flight-challenged fairy called (what else?) Tinkerbum. Kate Werneburg and Hallie Burt (at right) bring Elizabeth-Darcy back to Campbell House. Photo by Dahlia Katz. 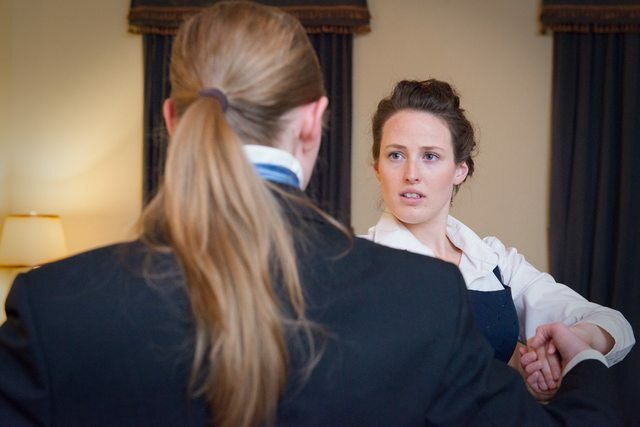 This two-woman adaptation of Jane Austen’s Pride and Prejudice, originally conceived for the Fringe Festival, has become a favourite of Campbell House’s many site-specific shows; this is the second year that actors Elizabeth Wernenburg and Hallie Burt will roam throughout the historic mansion as dozens of the beloved novel’s characters. Fans of the novel will delight at seeing the characters subtly realized; those unfamiliar with the book may find it the swiftest way to become familiar with the classic. 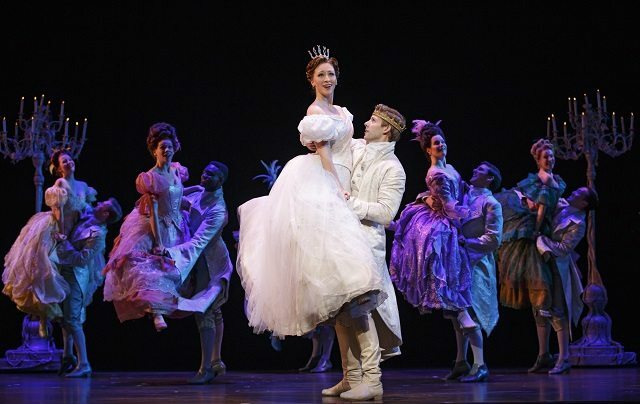 Ella (Kaitlyn Davidson) gets a lift from Prince Topher (Andy Huntington Jones) in the touring Broadway production of Rodgers and Hammerstein’s Cinderella. Photo by Carol Rosegg. When Rodgers and Hammerstein’s Cinderella made its debut as a television special in 1957, it showcased a young Julie Andrews, the future star of such movie classics as Mary Poppins, The Sound of Music, and Thoroughly Modern Millie, and an icon of all that is good and wholesome. Her sweet spirit seems to have inspired the rewritten 2013 Broadway version playing the Ed Mirvish—it’s thoroughly modern in attitude and exceedingly nice. In Douglas Carter Beane’s new spin on the Perreault fairy tale, not even the baddies are all that bad. Cinderella’s stepmother (Blair Ross) is more selfish than wicked, while one of the stepsisters is merely a silly spoiled brat (Aymee Garcia), and the other (Kimberly Fauré) is actually a good egg in love with a local activist (David Andino) who’s fighting for the rights of the kingdom’s 99 per cent. Ella herself (Kaitlyn Davidson) is a do-gooder as well as a dreamer, who brings to Prince Topher (yep, not Charming, Topher—played by Andy Huntington Jones) not just love but a sense of purpose. There could be more magic in Mark Brokaw’s production, but the R&H score is pretty and the acting is fun (especially Blake Hammond as the prince’s scheming advisor—he seems to be channeling the ghost of the great Leo McKern). This show won’t knock your glass slippers off, but bring along a little girl or two and chances are they’ll be enchanted. Jacob Two-Two (Drew Davis, centre) and superhero duo Child Power (Jeigh Madjus, left, and Sarah Gibbons, right). Photo by Cylla von Tiedmann. With kids idle from school during this season, all ages theatre abounds. Red Sandcastle Theatre in Leslieville features a holiday panto (Jacques and The Bean Stock Market), and uptown and year ’round children’s theatre company Solar Stage Theatre showcases one of their own (Krampus The Christmas Curmudgeon). But it’s Young People’s Theatre that has the biggest kids show in town, even though it’s not precisely holiday themed. 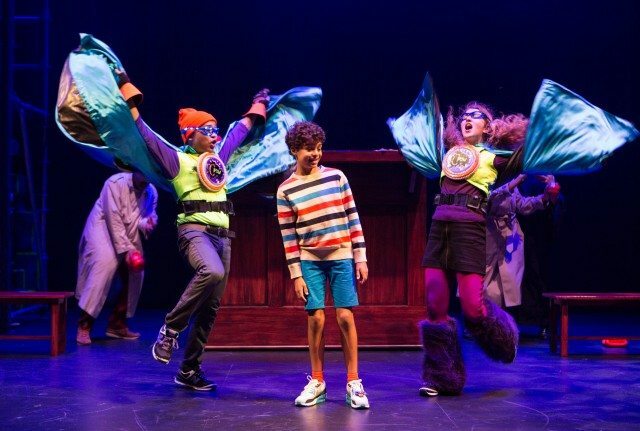 Jacob Two-Two Meets The Hooded Fang, an adaptation of Mordecai Richler’s children’s book classic, has been given an all new staging and score by Britta and Annika Johnson, the sister-team responsible for the music of Brantwood (Now Magazine‘s Audience Choice winner at the Dora Awards this summer). Its titular hero Jacob Two-Two (a charming, clear-voiced, and age appropriate Drew Davis) ends up in a fantastical island prison for (not at all) misbehaving children, run by former pro wrestler The Hooded Fang (a delightfully pompous and insecure Damien Atkins). Some critics familiar with past productions of the show at YPT have been dismissive of this new version, but we were charmed by strong character and signing turns like Saccha Dennis as an uptight judge, and Kira Guloien as a preening Mistress Fowl—and YPT’s set and costumes as usual were superb. 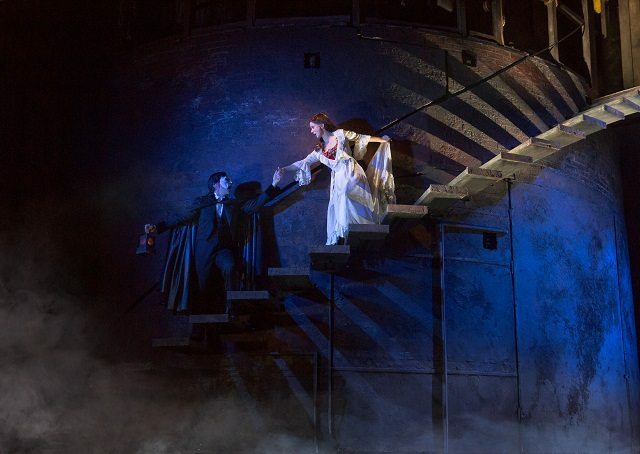 Chris Mann as the Phantom leads Christine (Katie Travis) to his underground lair in the new touring production of Andrew Lloyd Webber’s The Phantom of the Opera. Photo by Matthew Murphy. Although not as musically or dramatically rich as that other Cameron Mackintosh behemoth, Les Misérables, Andrew Lloyd Webber’s The Phantom of the Opera has its fans—why else would it now be the longest-running musical on Broadway? They won’t have any reason to complain about the impressive new design elements in super-producer Mackintosh’s refurbished touring version. They might even buy into the idea of a younger Phantom (Chris Mann), who is now a more credible rival for the love of his protégée, Christine Daaé (Katie Travis). But how will they feel about the new chandelier? In the original 1980s production, it came crashing onto the stage like a crystal wrecking ball, making you jump out of your seat. Now, while it may be bigger and shoot sparks, it makes a stately descent from the theatre ceiling like a dowager coming downstairs for dinner. Those of us who aren’t Phantom fans can still appreciate Paul Brown’s new rotating set, which gives a more vivid sense of the opera house’s backstage world and also makes extensive use of mirrors (all the more metaphorical for a title character who can’t stand the sight of his deformed face). We can also enjoy some fabulous singing, especially from Travis. But these things aren’t quite enough to compensate for what is really just a tarted-up melodrama that takes itself too seriously. Kayla Lorette (centre) gives thanks over the bodies of Hannah Spear and Miguel Rivas. Photo by Simon McCamus. Friday December 18, 8 p.m., & Saturday December 19, 9:30 p.m. The dedicated comedy venues in Toronto have holiday offerings too, of course. 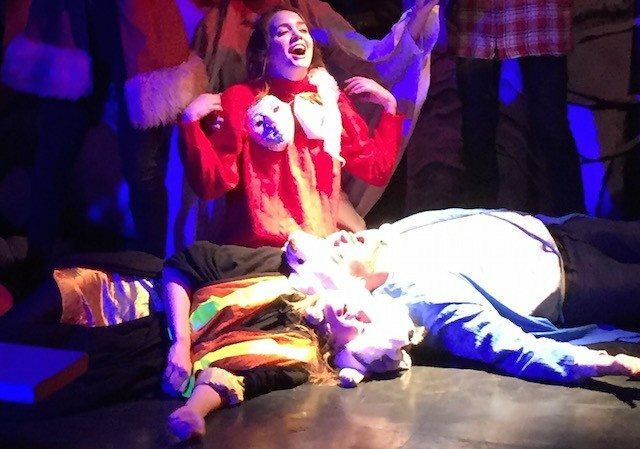 The Social Capital Theatre has an improvised Twisted Christmas Carol right in the days right before Christmas, and Bad Dog Theatre has been running The Pageant all December, creating new holidays based on audience suggestions for the cast’s fictional family to explore and eventually stage in a show within the show. At the night we attended, Kayla Lorette (who, with The Pageant‘s director Evany Rosen, graced the cover of Now Magazine last week) was a comedic highlight as a nosy neighbour, but it was Hannah Spear as an overly accommodating pregnant mother and Alistair Forbes as a wealthy pre-teen entrepreneur doing his best to balance his business and family obligations who gave the show a light touch of emotional grounding. Credit for that certainly belongs in part to Rosen, who (we presume) has a guiding structure for the show that gets the fractious townsfolk to the titular staging, which devolves into hilarious chaos. Eponine Lee’s Billie commiserates with Courtenay Stevens’s retired Santa over milk and cookies in Tails From the City. Photo by Neil Silcox. 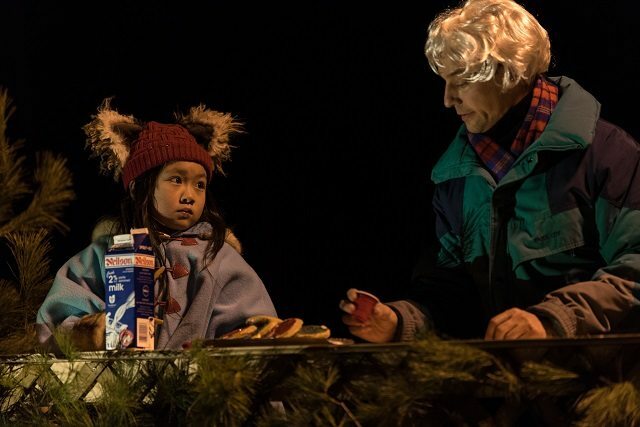 Common Boots Theatre’s Tails From the City has a cute kid, a funny Santa, and some mischievous raccoons—what more could you want? Well, how about a comprehensible storyline? Marjorie Chan’s script for this year’s outdoor holiday show at the Evergreen Brick Works could use a clearer plot, or at the very least a narrator to guide it. Ostensibly about the uneasy relationship between humans and wildlife in the city, Chan’s play concerns a motherless little girl named Billie (Eponine Lee) who quarrels with her dad (Derek Kwan) on Christmas Eve, then falls asleep and has a crazy dream. It involves aforesaid raccoons—whose activities include playing hockey and dishing up a garbage-bin feast—as well as a retired St. Nick (Courtenay Stevens) who has sold off his global gift-distributing business and come to regret it. There’s an amusing scene where the not-so-jolly soul, now a widower, bonds with Billie over cookies and milk. But most of the show is just a series of set-pieces like that, strung together and looped in with a tepid subplot about a shallow couple (Lucy Hill and Michael Rinaldi) who cut down a Christmas tree and leave a family of squirrels homeless. While adults will get a kick out of Stevens’ gruff ex-Santa, and children will be beguiled by the animals (played by Hill, Kwan, Rinaldi, and Stevens in clever costumes by Anna Treusch), this is not one of the better-conceived promenade productions from Common Boots (formerly known as Columbus Theatre). Like Toronto’s irrepressible raccoons, it’s both lovable and frustrating at the same time. It opens tomorrow night at the Storefront Theatre, and we have high hopes for this comedic holiday musical, adapted from a Quebecois folk tale, and featuring four gender-swapped fur trappers (Tess Benger, Kat Letwin, Dana Puddicombe, and Shania Silver-Baird) who make a deal with the devil to make it home to their beaus for the holidays. Puppets, an original score by James Smith, (Brantwood, Mr. Burns: A Post-Electric Play), direction by Tyrone Savage (who helmed last winter’s exceptional Who’s Afraid of Virginia Woolfe? at Storefront), and a large ensemble that rivals that of their last show, The Castle, make this one of the most intriguing shows the prolific indie venue has tackled yet. The Second City’s Unwrapped stars (back row) Brandon Hackett, Lindsay Mullan, Alessandra Vite, and Roger Bainbridge, and (front row) Devon Hyland and Ann Pornel. Photo by Racheal McCaig. 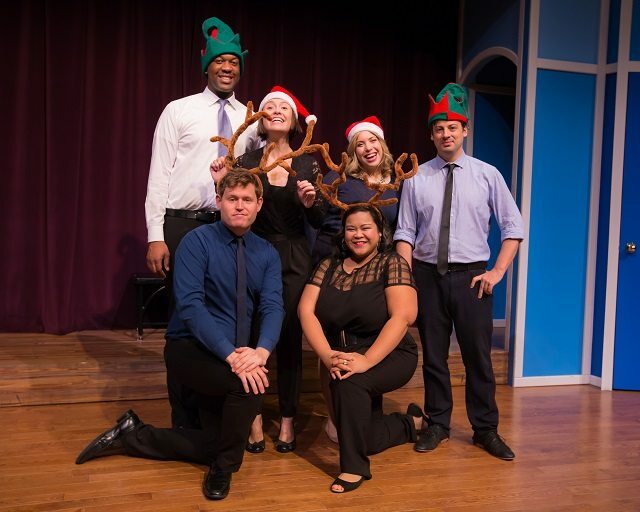 You’ve gotta feel sorry for the creator-performers of The Second City’s holiday show: they went and composed an opening number about the drudgery of winter and here we are enjoying an unseasonably warm, snowless December. That’s not their fault, of course, but it sets the tone for Unwrapped —from there on in, everything about the show feels slightly off. The sketches aren’t as funny and inspired as they were in last year’s Holidazed and Confused, and even the good ideas don’t pay off the way they should. Among the better ones are a cheesy family-photo session during which everyone reveals their inner thoughts; and a game of one-upmanship among stranded passengers competing for the lone seat on a crowded airplane. But the show’s shiniest baubles turn out to be solo bits, such as Lindsay Mullan playing the Virgin Mary, tipsy on water-turned-wine at Jesus’ birthday and revealing to her son that Joseph isn’t his dad. And there’s also a nice contribution from Brandon Hackett as a mellow Nat King Cole-type crooner trying breathlessly to sing an all-inclusive holiday ballad. Don’t get disheartened, though: stay after the show for the improv encore, which on opening night was far more gut-busting than any of the scripted material. Once again, The Second City is also presenting a family-friendly daytime show. This year, it’s The Naughty Listers, a musical tale of naughty children and naughtier elves. Check out the theatre’s website for more information. 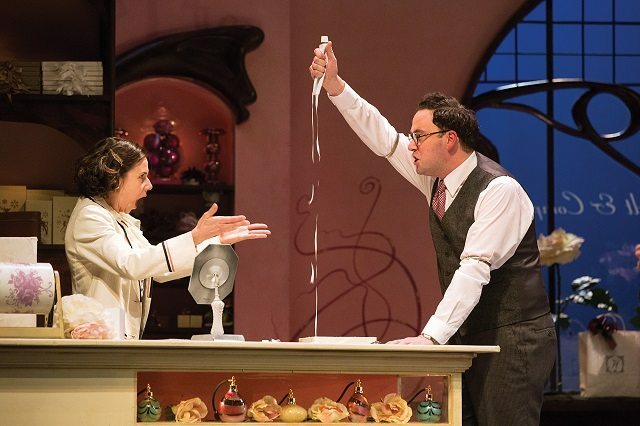 Michelle Monteith and Gregory Prest take on the roles of warring shop assistants Rosie and George in Soulpepper Theatre’s latest revival of the romantic comedy Parfumerie. Photo by Cylla von Tiedemann. Soulpepper, now Toronto’s biggest not-for-profit theatre, is also going big on the holiday programming this season. The company has expanded to the St. Lawrence Centre’s Bluma Appel Theatre to remount two of its most popular shows, Ins Choi’s national hit Kim’s Convenience and its adaptation of Miklós Laszló’s Hungarian holiday classic Parfumerie. Both are highly recommended. Kim’s, already a timely play, is even more appropriate right now, as Canada welcomes its first influx of Syrian refugees. Choi’s insightful comedy looks at two generations of a Korean-Canadian family, and in the person of the lovable, larger-than-life Appa (masterfully played by Paul Sun-Hyung Lee) embodies both the hardships and rewards of the immigrant experience. Parfumerie, which inspired the 1940 Hollywood classic The Shop Around the Corner (and its 1990s update, You’ve Got Mail), is a charming romantic comedy directed to perfection by Morris Panych. For this remount, two of Soulpepper’s finest young actors, Michelle Monteith and Gregory Prest, take on the roles of feuding shop attendants Rosie and George. 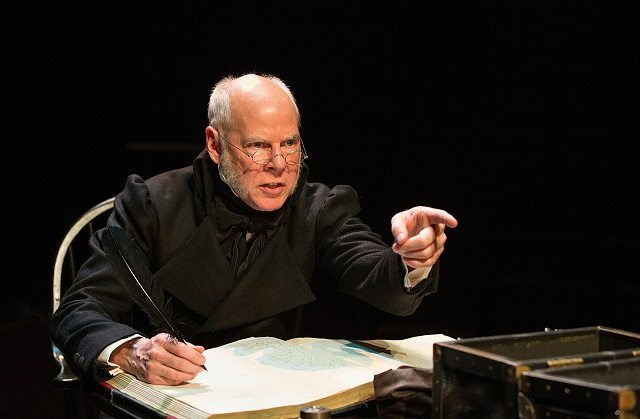 Oliver Dennis portrays the Victorian miser Scrooge in Soulpepper Theatre’s A Christmas Carol. Photo by Cylla von Tiedemann. Meanwhile, back in its home digs at the Distillery District, Soulpepper is also remounting two other faves: its spare but moving adaptation of Charles Dickens’ A Christmas Carol and its energetic staging of Dennis Lee’s beloved children’s poems, Alligator Pie. There’s a twist to the Carol this year: Oliver Dennis—who in the past has played the put-upon clerk Bob Cratchit—is now alternating in the role of Scrooge with its usual occupant, Joseph Ziegler. Seeing Dennis, who is possibly Soulpepper’s funniest performer, tap into his dramatic reserves as Dickens’ stone-hearted miser is reason enough to revisit this uplifting production. And the company has even more going on: it’s presenting magician David Ben’s new show Tricks (running to Jan. 3), and a series of festive concerts called A Very Soulpepper Christmas (Dec. 19, 20, 23, 26).